Dear Authors, you are cordially invited to submit an extended version of your paper presented during the ISD2014 conference in Varaždin for publishing in the Journal of Information and Organizational Sciences (JIOS). Please download instructions for submitting extended version of the papers. 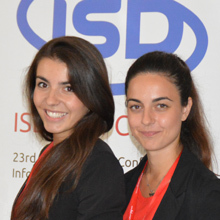 Thank you for attending ISD2014 Croatia conference, it was our pleasure to be your host. Please visit a webpage http://isd2014.foi.hr/photos-videos.php for photos and videos of the conference events. Several conference events and sessions will be live streamed and archived for later view. Technical support is provided by the Croatian Academic and Research Network (CARNet). Please see the schedule of streamed events at the page Live Streaming. A final version of the conference Agenda and Timetable is published, without the changes to the previous one. We are proud to announce a conference mobile application ConfBox. Application is available for Android, Windows Phone and iOS. To download data about ISD2014 conference (schedule, info about papers, participants etc. ), please use the following code: ISD2014mobile. Dear ISD2014 delegates, preliminary Agenda and Timetable can be found at Program/Timetable page. You can also download timetable in PDF version (update 2014-08-18). The organiser reserves the right to change the program without prior notice. More information about Welcome Ceremony (September 2, 2014) and Croatian Evening (September 3, 2014) is published. We hope you will attend and enjoy both events. Dear authors, please consult Presentation Guidelines in order to prepare your papers to present them on ISD2014 conference. Every paper is allocated a time slot of 30 minutes: 20 minutes for the presentation; 8 minutes for questions and discussion; 2 minutes for the switch between presenters. This year ISD conference has received 91 submissions. Out of them, 47 camera-ready papers were accepted for presentation and publication, giving 51.7% acceptance rate. Dear authors, we have extended deadline for early-bird registration to July 20, 2014. Due to administrative limitations which you might experience with your university, bank transfers for early-bird registrations are accepted until July 27, 2014.
Review process for the ISD2014 conference is ongoing. Reviewers can access assigned papers on EasyChair management system. If you don't have EasyChair account, please sign up for the account. Submission of new papers to the ISD2014 Conference is officially closed. However, you can resubmit a new version of your paper until Sunday 11th May, 2014, 23:59:59, GMT +0. Please take that opportunity to revise your paper and resubmit it if necessary before the paper is sent to a review next week. Also, note that we have extended a deadline for Notification of Acceptance to June 20, 2014. Accepted papers should be revised and prepared to a Camera-ready version by July 7, 2014. Dear authors, EasyChair will accept new submissions or updated versions of the papers until May 5, 2014, 24:00, GMT +0. We are looking forward to receive your paper by that time. Please make sure that your paper in .pdf does not contain any information about the author(s) and their affiliations. Due to a number of requests, paper submission deadline is extended to April 30, 2014. Please note that this is a hard deadline and new extension won't take place. The submission deadline is approaching. Please read the Submission Details page for more information on paper formatting and submission. We have published details on conference tracks. Find out more about the tracks description, topics and track chairs. The ISD conference is now "An Affiliated Conference of the Association for Information Systems". The ISD2014 conference theme is "Transforming Organisations and Society through Information Systems". Inspired by the idea behind the conference title, we have also transformed visual identity of the conference. The ISD2014 Croatia will be hosted by the University of Zagreb, Faculty of Organization and Informatics (FOI), Varazdin, Croatia. The main faculty building is located in the very center of the City of Varazdin, overlooking the main square. Varazdin is a small charming city in the continental Croatia, country located in Central and Southeast Europe. Rich historical heritage and lively present make the City of Varazdin one of the most interesting places in Croatia.